Posted July 11, 2014 by Heather Michet & filed under Exercise, Fitness, Health Tips, Water. In Water Baby, Part 1 of the Swimming blog series, I talk about my introduction to the water and how it got me through a grueling restaurant server job and boosted my health and fitness. During the last couple of years, I’ve been craving (and pushing myself) to get back into the pool and I’ve finally achieved getting it into my weekly schedule. It feels great. You too, can feel a whole lot better from a swimming workout. Whether it’s to attain overall fitness, build endurance, train for a triathlon, or recover from an injury, swimming cannot be beat. If you need swim lessons for yourself or family members, check with the above noted organizations available in your area and The Red Cross. 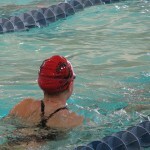 I’ve watched other lap swimmers refer to a card after completing several laps. It took me a few sessions to figure out that they were looking at a swim workout routine. This site has all levels of plans starting with Beginning on up to Advanced. Choose a plan that will fit your current ability level and start out gently, working up to higher distances and strength/endurance. Remember: it’s the small steps done consistently that lead to sustainable change whether it comes to weight loss, exercise or any other positive habit. For those turned off by swimming in chlorinated pools, read Hydrogen Peroxide to Swimmers’ Rescue, Part 3 in the Swimming blog series, with a tip for how to neutralize the odor and ill effects of chlorine on the body with extended exposure. Go for it, Kathy! You can also do some water aerobics which is very gentle on the body, yet provides a good workout. Sue – I’m so glad you are liking the blogs! One suggestion to help with the internal effects of chlorine absorption is by using essential oils in a blend. The application would be topical. You could try Fresh Air Fare(tm) or a custom-formulated blend. I’d love to help you with this!